A quiet neighborhood in a small town in Liberty County, Hardin, TX suddenly had lots of excitement. State police, Liberty Sheriffs department the Press and tv station helicopters were buzzing around like flies on a carcass Officers. The media reported that there was blood and body parts at a mass grave. All this was generated by a tip from an anonymous psychoic. News today is fast breaking and demand for instant gratification on the latest breaking story results in, the press getting in wrong. In this case though it has been reported that the Liberty County Sheriffs Department, actually tipped off the Houston media. Police in Texas are investigating whether a tip-off from a woman claiming to be a psychic that sparked a hunt for a mass grave of dismembered bodies, including children, was a hoax. 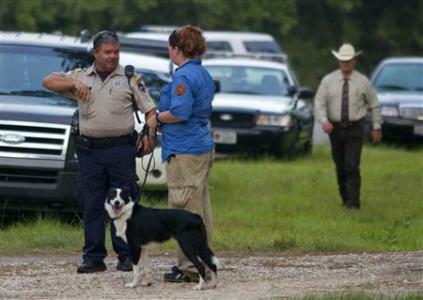 Officers raided a rural farmhouse in Hardin, north-east of Houston, after receiving a report that up to 30 bodies were hidden inside. But police gave up the search hours later after nothing untoward had been found. “There’s no crime scene,” said Liberty County judge Craig McNair as deputies, Texas Rangers and FBI agents ended their fruitless search that was beamed live to millions on national TV. I some how doubt that the tipster was so anonymous because the police seem to know who she is. But the “anonymous” tag was used several reports. Jeffrey Liakos on The Certainty of Death and Taxes. Michelle on Lessons on Cord Cutting.